The ELF is a time-saving fixture designed to reduce assembly time and increase output for medical device manufacturers. It is a custom-designed fixture that simultaneously releases retention elements on a pouch card within seconds. Without the need for assembly teams to perform this manually, medical device manufacturers can expect their output to increase significantly. 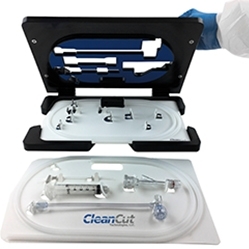 Anaheim, CA, February 27, 2018 --(PR.com)-- CleanCut Technologies has announced the launch of the company’s new time-saving fixture designed to reduce assembly time and increase output for medical device manufacturers. The Easy Loading Fixture or “ELF” is a custom-designed fixture that simultaneously releases retention elements on a backer card within seconds. Without the need for assembly teams to perform this manually, medical device manufacturers can expect their output to increase significantly. The ELF is not only strong and durable, but exceptionally easy to use. Simply place the backer card in the ELF, close the lid and push the handles. The ELF is custom-designed to the exact specifications of your device, which allows the pins within the ELF fixture, to accurately push all retention elements in place. Medical devices can be conveniently loaded on the backer card either inside, outside or on top of the ELF. The backer card is then easily removed with devices safely and securely in place. For more information on the Easy Loading Fixture “ELF,” contact CleanCut Technologies at info@cleancuttek.com or by calling 714-864-3500. CleanCut Technologies is an FDA QSR compliant and ISO 13485 certified, one-stop source medical device packaging company located in Anaheim, California. Products are manufactured in Class 7 (10,000) & Class 8 (100,000) certified environments with full traceability. CleanCut Technologies has announced the launch of the company's new time-saving fixture designed to reduce assembly time and increase output for medical device manufacturers.